Successfully Added Mini IP Security Camera - 4MP, 1/3 Inch CMOS Sensor, IR Cut, Night Vision, Motion Detection, Mobile Support, ONVIF 2.0 to your Shopping Cart. Enjoy total peace of mind as this mini IP security camera watches over your home or office while you are away. With 2560x1440 video resolution and 1/3 Inch CMOS Sensor, you will get a clear picture of happening in your property. The mini IP security camera will be a reliable guardian for your home. Thanks to ONVIF 2.0 support, it can easily become part of your existing security system while also suitable to make an independent security setup. The camera will record quality footage and snap clear pics with its 2560x1440 video resolution and 1/3 Inch CMOS sensor. With a 180 degree viewing angle, you will get to see a wider scope of your property without missing out on key details in the background. 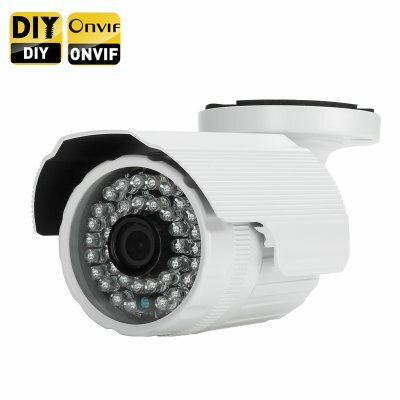 You can use the camera both indoors and outdoors and it will provide you with reliable video feedback even after it gets dark thanks to its 25-meter night vision with 36 IR LEDs. This makes it the perfect security option for your backyard, garden, shed, storage facility or other areas. The camera comes with motion detection and you can set up 4 detection areas. Should motion be detected in any of them, the camera will send you an email with a snapshot of the area. Thus, you will always get timely alerts should any suspicious activity take place. With mobile support, you can review the camera’s footage on your Android or iOS smartphone or use a web browser like Chrome or Firefox. Simply downloas the dedicated app from the Play Store or App Store and after a quick setup, you will be able top always see what’s happening at home right on your smartphone. The Mini IP Security Camera comes with a 12 months warranty, brought to you by the leader in electronic devices as well as wholesale IP cameras.